One class in, Melody Morris knew she found her niche. Now she’s an interior designer ready to start her own business. Melody Morris was working in her home office, doing medical billing and coding when she had her aha moment. An HGTV and do-it-yourself enthusiast, Morris spent weekends doing home improvements and repurposing projects for family and friends. Morris, 33, enrolled in Tidewater Community College’s interior design program in 2014 because it was affordable and the only accredited program in Hampton Roads. After her first class, she knew she’d found her path. “I love those reveal moments you see on shows like ‘Fixer Upper,’ and now I’m in a place where I get to present those moments to clients,” she said. 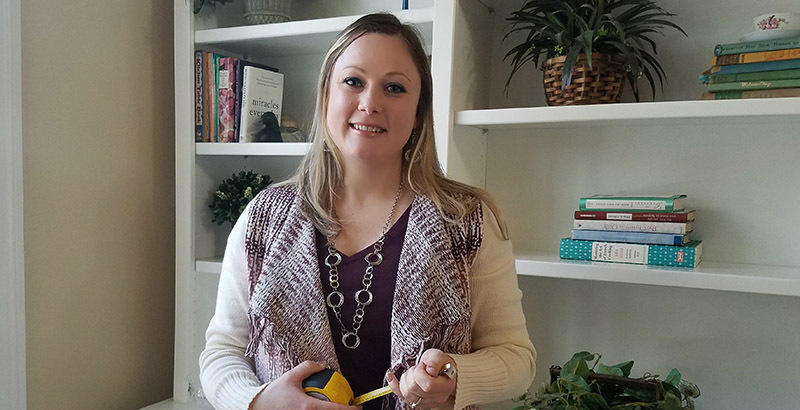 Morris, who earned her Associate of Applied Science in Interior Design in 2017, is working to build her own business. She also works part-time at Kempsville Cabinets doing kitchen and bath design. She is responsible for creating CADD files for all of the organization’s designers so clients can see how their spaces will look when transformed. Morris enjoyed the hands-on work and portfolio building projects at TCC, and, of course, her internship which led to a position at the cabinet company. Morris is working toward certification from the National Kitchen and Bath Association, a desired credential for those in the field. A Chesapeake resident, Morris lives on a small farm and raises chickens, ducks and geese. She and fiancé Ryan Zuniga have two Chihuahuas, Luna and Toby.